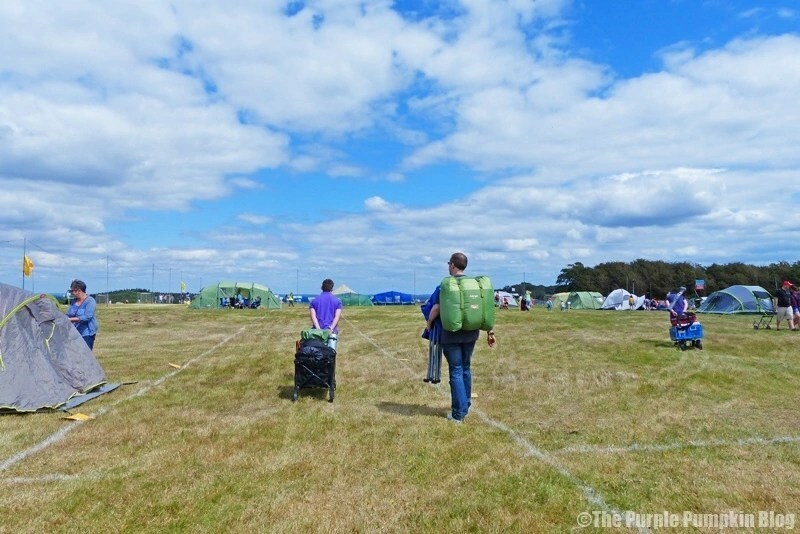 If you’ve been reading my blog recently you’ll know that we recently went camping at our first family festival – Camp Bestival! Since this was our first time camping we started to look around at the different tents that are available on the market – so many types and at varying prices, as well as all the other gear we were going to need – sleeping bags, cooking equipment etc. My mind was boggling! Then Vango kindly stepped in to collaborate with me and my blog, and provided us with a tent, airbeds, sleeping bags, rucksacks and cooking utensils – the very basics we would need to spend a few nights outdoors! Thank you Vango! With a strong heritage to be proud of, all Vango gear is developed from experience. The outdoors is their DNA. 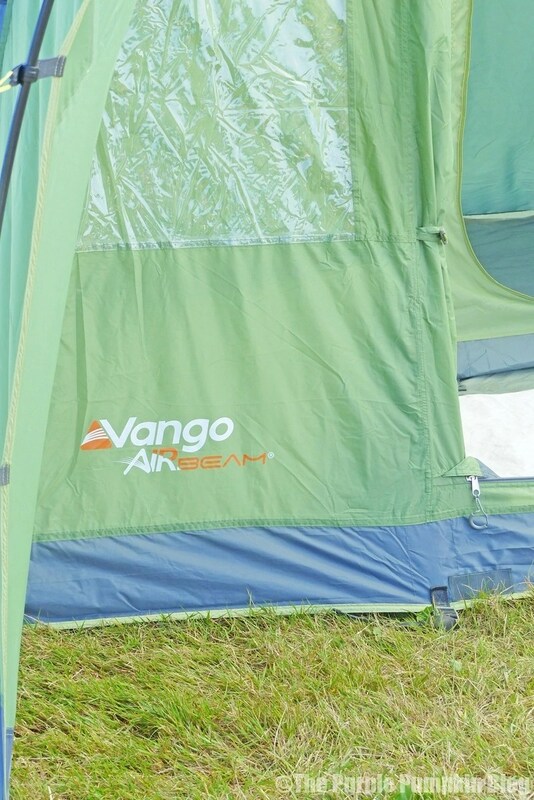 Since 1966 Vango has been developing tents and outdoor equipment for a wide spectrum of outdoor users who trust and rely on the quality they know comes with the Vango mark. Coming from Scotland, they know a thing or two about weather conditions. 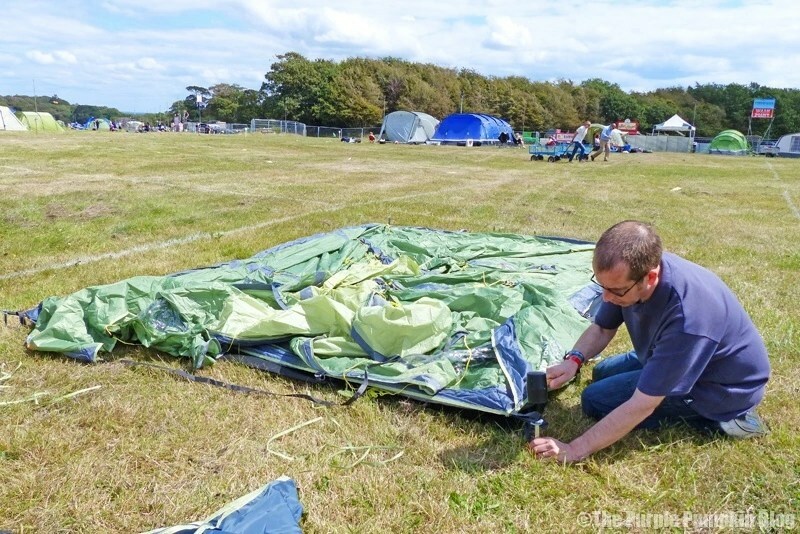 I didn’t take any video of Steve and Liam pitching the tent – I was too busy reading out the instructions (which are very handily sewn into the bag which the tent comes in) and taking some snaps for my review. I did however, take video of the packing up of the tent, which you’ll be able to watch at the end of this review. 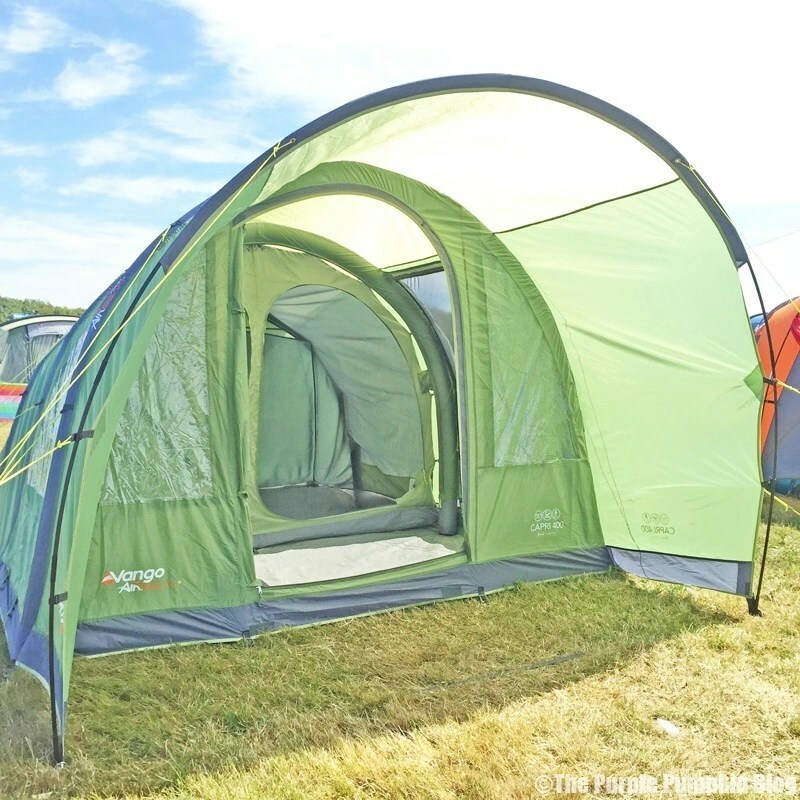 Everything you need to pitch the Capri 400 is inside the bag – the tent itself, the tent pegs (there are three kinds), the folding pole for the front extension, and the air pump for the beams. It is amazing that such a large tent fits in such a neat and compact bag! A mallet is not included. So remember to bring one! The Capri tent has a fully sewn-in groundsheet, which meant a bug-free and draught free environment. The tent benefits from the flysheet and inner being together, making for easier pitching and packing, as well as the strong and rigid beams which are quick to inflate and deflate. Next, the tent was unfurled from its bag, spread out over the footprint, and the four main tent pegs were hammered in. These corner pegs were a lot bigger and thicker than regular tent pegs. Next up was the beams – there are three on the Capri 400, and the middle one gets blown up first. The instructions say to locate the inflation point on the beam, remove the valve cap, and insert the correct pump adaptor, which will lock onto the valve (diagrams are included on the instruction sheet). It goes on to say that there is no need to turn the white valve button as the adaptor will move that into the correct position; which didn’t happen for us. As soon as we removed the pump to seal the valve, it kept deflating. Much to the amusement of me, and a nearby family who were intrigued by the blow-up aspect of our tent. Steve realised that something was out of position, and put it right… the beams were then up in no time at all! The tubes are inflated to 7psi, and must be guided into position. They should not exceed 8psi, and not be over-inflated. 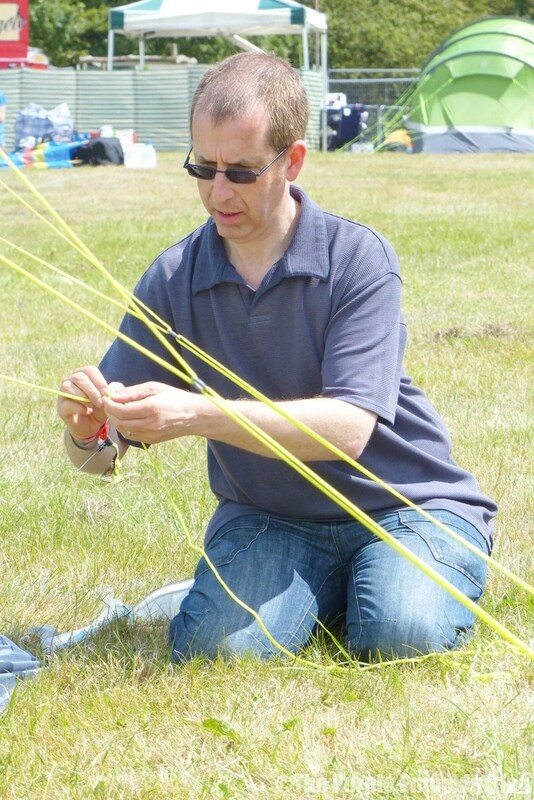 With the beams now up, there were some more tent pegs to put in along the edges of the tent. The front extension is optional, and it is advised not to put this up in high winds, but as the weather was gorgeous, it went up for us, and gave us a nice bit of shade from the sun when sitting outside our tent. The extension uses a pole, which folds down to fit in the bag and is threaded through. Final pegs were put in place, and then all of the guylines were pegged out and adjusted as required. 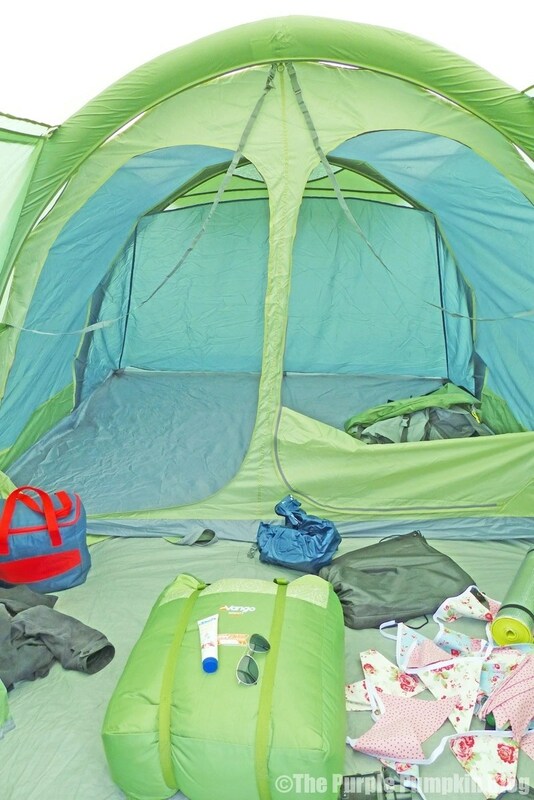 Inside the tent are the Patented Vango TBS ®II – Tension Band System which ensures that your tent performs in adverse conditions, especially strong, changeable winds. In calm conditions the system can be disconnected if desired. 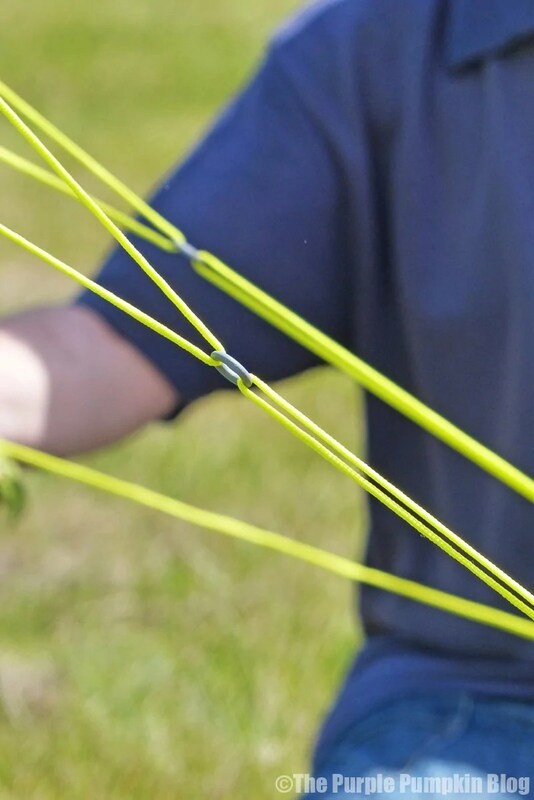 When tensioned, the bands brace the pole and prevent sideways movement. The buckles should be adjusted so that slack is removed, but not over tensioned, as this may deform the poles. You can see them in the photograph below. 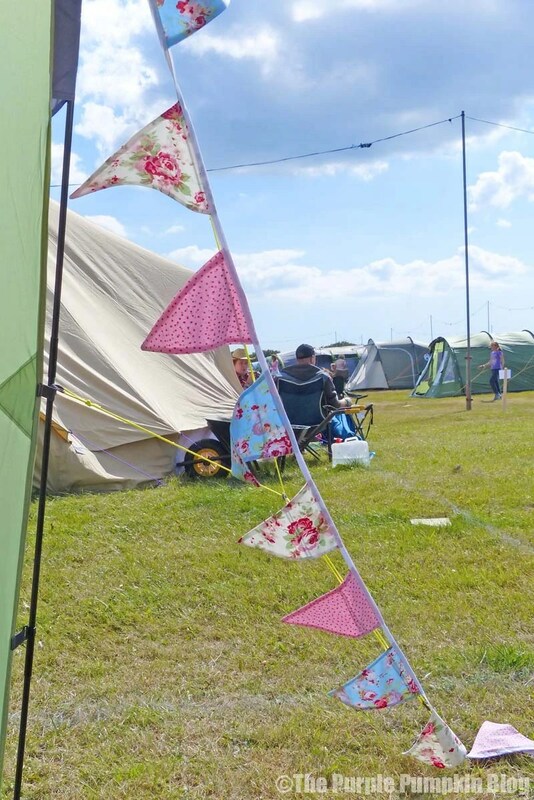 Whilst the boys blew up airbeds, I did the important things like tie my fabric bunting onto our tent – we were at a festival after all! What is the tent like inside? 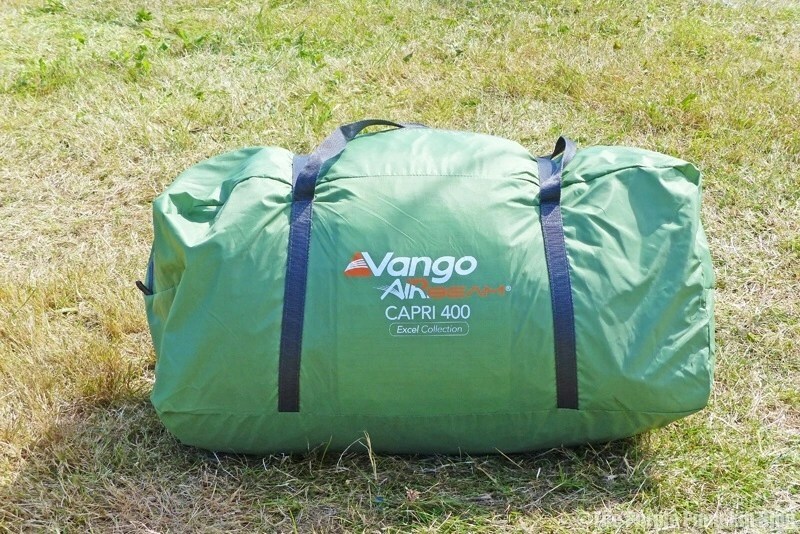 Vango also kindly sent us a Hi-Rise Double Airbed which is larger than average, at 210cm (which is 6′ 10″ in old money) and just fit in the bedroom area of the tent. We actually pushed it to one side, leaving a space for us to keep our stuff. Liam had his single airbed (which we already owned) in the living area, which is where he slept each night. 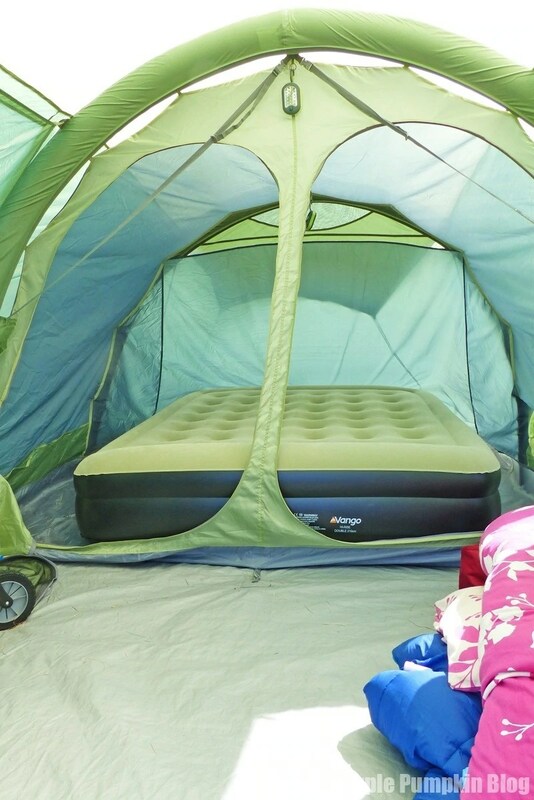 During the day, we tossed that airbed on top of ours. I’ll be writing about and reviewing Vango’s bedding in another post. 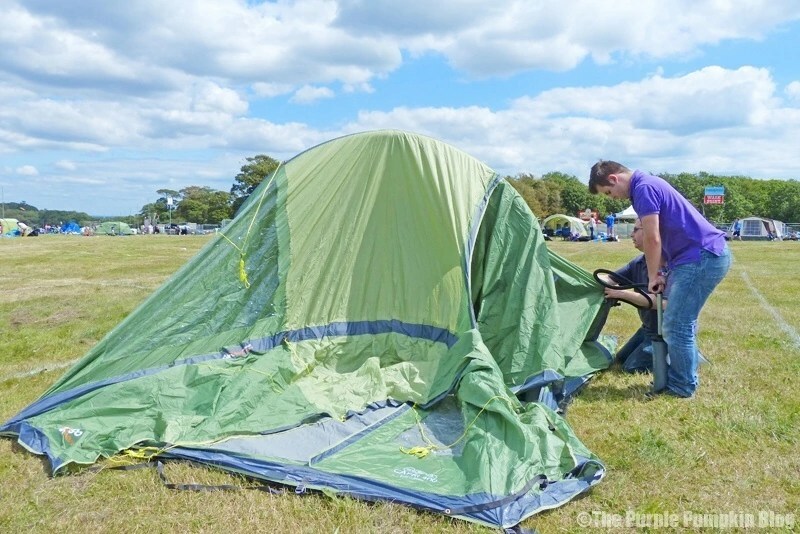 The Capri 400 is a 4-man tent, but I think it would be very snug and cosy – even if everyone did sleep on the ground! Bare this in mind if you are sharing with older children, or, like us, a teenager. There was good height in the tent – we were all able to stand up in the living area, with a bit of a duck-down for Steve and Liam in the bedroom area. I’m short though, so it didn’t matter to me! The little hooks in both areas of the tent were very handy for hanging up a light, as you can see demonstrated in my photo below. You can easily zip up one or both sides of the bedroom, and the top has a flap to let down if you need to let some air in. As well as the front opening, there is also one to the side, which you can add an optional side awning to. We are going to invest in this awning to give us some more space for our gear – even though the tent is sizeable, we kept having to move things around to get to other things, and that extra space would be welcomed – especially if the three of us go camping again. For just the two of us, it’s a fab luxurious size! We were bracing ourselves to be very cold at night, bringing extra blankets, woolly hats and gloves to sleep in. But, we found that they were not really needed. Whilst the temperatures did drop overnight, we didn’t feel like we were freezing cold – much to my relief – I’m not a fan of the cold! 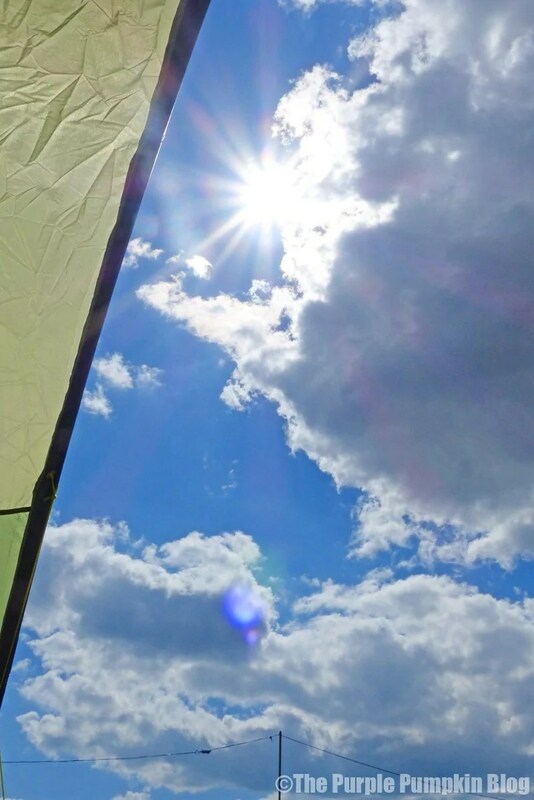 It was hot and sunny during the days, so I wonder if this helped to warm the tent up? And with the extra footprint laid down, sewn in groundsheet and the inner bedroom area, this all added up to create the warmth. Even Liam said he wasn’t cold at night in the living area which became his bedroom, which doesn’t benefit from the extra inner layer like the bedroom does. The AirBeam Capri is available in 2 different designs. 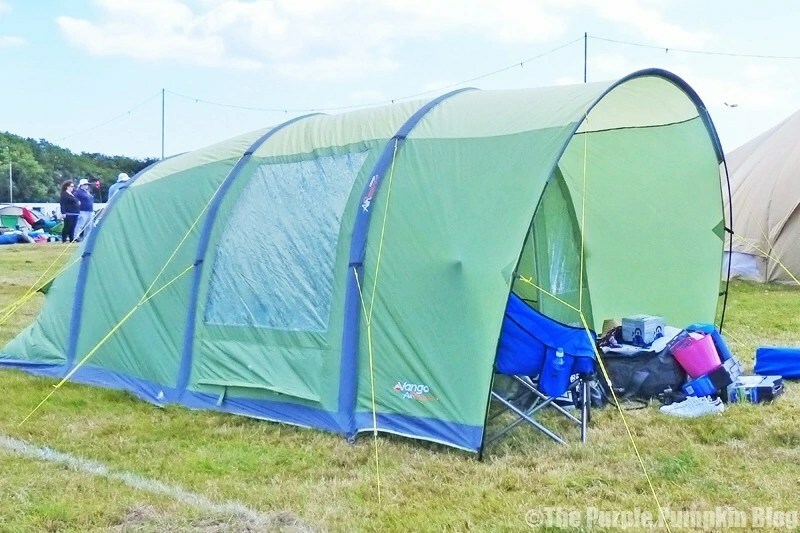 The 400, 500 & 600 are a compact design and the 500XL & 600XL are much larger family tents. 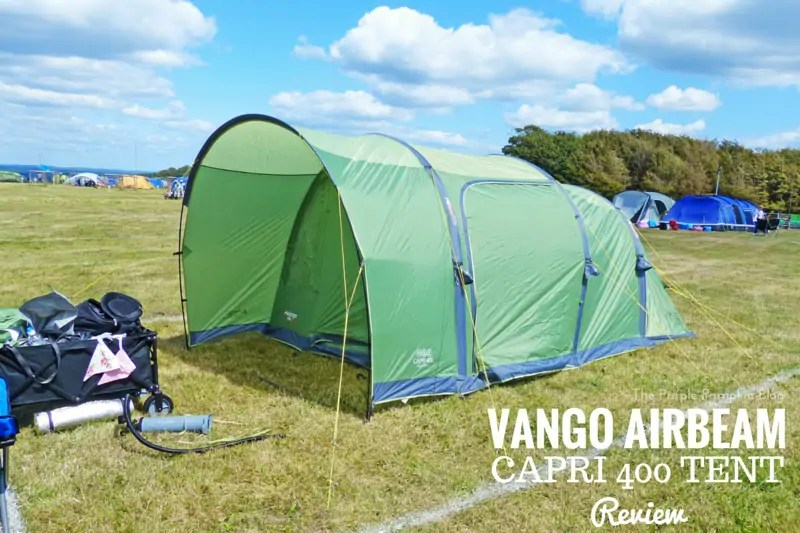 As you would expect, the convenience of this type of tent, means a slightly higher price tag (the Capri 400 is £400), but having experienced pitching, sleeping in, and taking down a Vango AirBeam tent, I would not hesitate to buy one. They’re comfortable to stay in, easy to put up and take down, and I think, great for first time campers – like we were! We have caught the camping bug, and can’t wait to plan another camping trip! 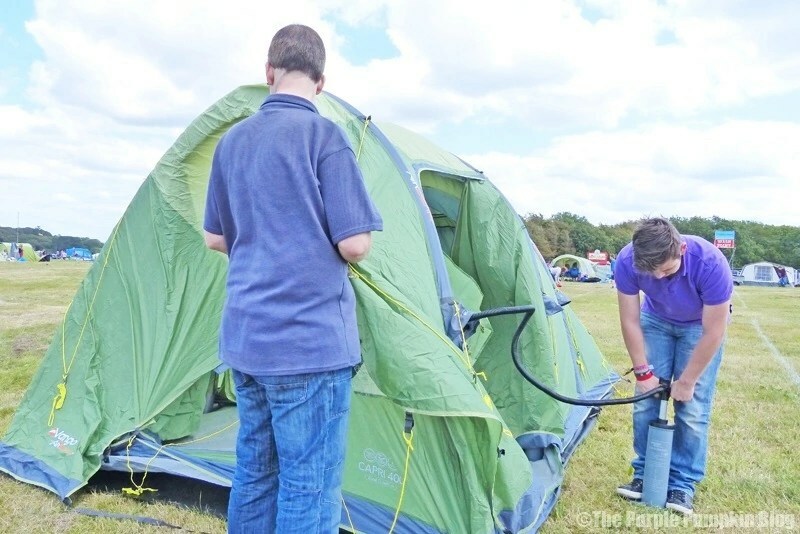 Finally, here is my video of Steve and Liam taking down the tent – real time is 12 minutes. I’ve sped it up so it’s just over 2 minutes! It was a simple as unpegging everything, opening the valves to let the air out and then folding it all up. With hindsight, we should have rolled the tent up once it was folded over, just to expel trapped air, but we will know for next time. And speaking of next time, I’ll be creating a video of Steve pitching this tent on his own at BlogFest – our next camping adventure! Vango say that their AirBeam tents can be pitched by one person, and my husband completely agrees with this (even though he had help from Liam this time around). We will find out at the beginning of September! Disclosure: We were sent this item to review. All thoughts are our own honest opinions. As a child we had a fantastic Vango tent. I would love to purchase one for my family and I to use now. Great review! Having used this one, I don’t think I would use any other brand for tents. It was so easy to pitch and take down, and kept us all very cosy at night. I have been after a tent for a while now, this looks like a good one! I know, no different, but a few people have said now how great Vango tents are, and now we’ve stayed in one, I definitely agree! I am so glad you got on well with it. Must admit we have only been camping once and are planning on doing it again this month and also have a Vango because after a lot of research it is the one that always came out on top. When I saw other campers struggling with poles and threading them through their tents, it made me realise just how simple the AirBeam style tent was. I wasn’t sure if we would love it, but turns out we did… although, if it had been pouring with rain, my answer *may* be a little different!! I’ll be honest I hate camping, during my period last year of redundancy I finally got a summer job at the local caravan site and the people there just whipped up there tents out of the smallest bags and I was always so impressed. I just like my own bed too much but that tent is very impressive and easy looking to put up. I love the bunting!